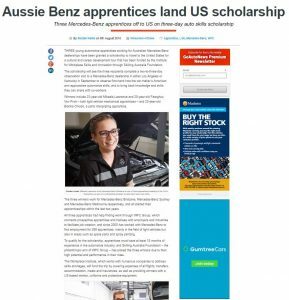 Go Auto News – August 9, 2018: Three young automotive apprentices working for Australian Mercedes-Benz dealerships have been granted a scholarship to travel to the United States for a cultural and career development tour that has been funded by the Institute for Workplace Skills and Innovation through Skilling Australia Foundation. The scholarship will see the three recipients complete a two-to-three-day observation visit to a Mercedes-Benz dealership in either Los Angeles or Kentucky in September to observe first-hand how the car-maker’s American arm approaches automotive skills, and to bring back knowledge and skills they can share with co-workers. Winners include 23-year-old Mikaela Lawrence and 20-year-old Fearghus Von Prott – both light vehicle mechanical apprentices – and 23-year-old Bianka Chiodo, a parts interpreting apprentice. The three winners work for Mercedes-Benz Brisbane, Mercedes-Benz Sydney and Mercedes-Benz Melbourne respectively, and all started their apprenticeships within the last two years. All three apprentices had help finding work through WPC Group, which connects prospective apprentices and trainees with employers and industries to facilitate job creation, and since 2000 has worked with Mercedes-Benz to find employment for 266 apprentices, mainly in the field of light vehicles but also in areas such as spare parts and spray painting. To qualify for the scholarship, apprentices must have at least 18 months of experience in the automotive industry, and Skilling Australia Foundation – the philanthropic arm of WPC Group – has picked the three winners due to their high potential and performance in their roles. The Workplace Institute, which works with numerous companies to address skills shortages, will fund the trip by covering expenses of all flights, transfers, accommodation, meals and insurances, as well as providing winners with a US-based mentor, uniforms and protective equipment. Apprentices have been receiving the scholarship yearly since 2016. All three Mercedes-Benz dealerships involved with the apprenticeship program are owned by Lei Shing Hong (LSH) Automobile, a Hong Kong-based conglomerate specialising in retailing vehicles, particularly from Mercedes-Benz, Porsche and Lamborghini. Last year, Daimler AG purchased a 15 per cent stake in LSH Auto International. LSH Auto Australia managing director John Good said promoting and developing apprentices was an important part of its business. “Skill development is one of LSH Auto’s core brand values and we work very closely with WPC Group to ensure that we are supporting, educating and developing young apprentices looking to break into the automotive industry,” he said.